SmartGrass is an artificial lawn, synthetic grass or "fake turf" product. SmartGrass uses a unique installation system to install synthetic grass for residential lawns, sports fields, and commercial landscapes. SmartGrass artificial grass is designed to mimic and replicate natural grass, giving you all of the pleasures of a beautiful lawn, without the headaches. SmartGrass uses its own proprietary artificial grass products, as well as being a licensed distributor for AstroTurf. The same qualities that make SmartGrass artificial grass an outstanding surface for sports fields and children’s play grounds, make it ideal for home and commercial landscapes. It is especially well suited for areas where natural grass is difficult to grow or where upkeep is impractical due to water restrictions or other environmental factors. Importantly, its durability makes it the sensible choice for high-traffic areas. 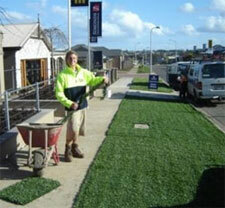 High-traffic grassed areas in residential or commercial settings. SmartGrass synthetic turf lets you have the perfect lawn, without the need for mowing, irrigation, thatching, weeding or control of insects and disease. SmartGrass synthetic grass is a revolutionary surface that can give you the lawn you want without the costly and time-consuming chores. SmartGrass also offers a range of acrylic surfacing, including Plexipave and Rebound Ace. SmartGrass artificial grass is ideal for all your landscaping needs, offering an unmatched combination of long-lasting durability and economy, while also looking attractive. If you want to cut yard maintenance out of your life, or at least reduce the time in your weekend devoted to mowing, SmartGrass synthetic lawn can do that for you. 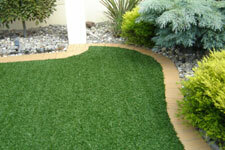 Neat, trim and bright green, our artificial grass will enliven your yard and give it a quick face-lift. Call today for a free quote. SmartGrass have branches located in Melbourne, Sydney, Perth and Brisbane, with other areas serviced by authorised SmartGrass synthetic lawn distributors. SmartGrass is also an authorised distributor for AstroTurf.